If you’re looking at taking your hand at sports betting, there area few golden rules you should become familiar with. Although these aren’t set-in-stone legal rules you absolutely have to follow, these are more of helpful guidelines that will better your chance of winning. Sports betting involves thinking, playing the odds, mixed with a little bit of chance. As much as you research your favoriteteam, you can never predict how they will indeedplay on the field. Upsets happen in the sports world. With these guidelines though, you can help to avoid an upset and move past if one occurs. Take a look at the following must-know rules that every sportbettershould know. The thing was betting is that you’re dealing with numbers. It would help if you understood some of thebasic math skills, including odds, probability, division, andmultiplication. A spreadsheet will be able to help you with this. You may think thatyou can bet off of a feeling and won’t need any math skills. However, if you want to be successful for the long haul, brush up on your basic math. It will make betting a bit more fun. Knowing the value of an odd is critical when it comes to sports betting. The odds of a bet will tell you the chance of your team winning, but the value of the odd will say toyou how much you will make in return. If you’re betting on the odds of Norway getting into the European Cup in 2020 on bettingselskaper.com, you’ll want to calculate the value of the bet along with the odds to see if your return is worth the money. Here is a golden rule to remember not just in sports betting, but in betting in general. There will come the pointwhen you lose. Whether it be small or big, you’ll need to let go and move past it. If you dwell on that loss,it may throw you off your game and push you to bet more than you usuallywould. The last thing you want to do is bet more and more money to make up for a loss, only to find yourself deeply in debt. The same can go for a winning streak. Your bets may be hot right now, but that doesn’t mean they will continue being like that. A winning streak can give you false hope and make you start to bet more than you normallywould. Stick with your original plan and don’t let the past direct your present decision. Although who doesn’t want to get rich quickly, that is easier said than done. In the sports betting world, long-term is more valuable than short-term. Start to increase your account slowly. Trying to go for the big wins right off the bat, you may lose more than what you bargained for. Instead, make the smaller bets at the start and work your way up until you have enough cash rolling in. 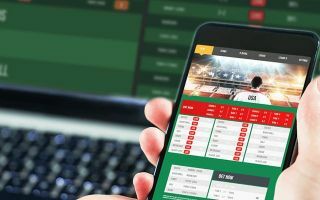 Use these must-know rules as guidelines to help you with your sports betting. The more research you do and understanding of what happens in the betting world, the better chances you may have of winning.